Quickpet will also open the Puppy Package Manager which is chock full of even more programs tested and configured for Lucid Puppy, including language packs for 11 different languages. PPM has other window managers ready to install, XFCE and Fluxbox, but Lucid even has JWM built in as an alternate--and of course a WM Switcher to make it all simple. Puppy is still a compact distro, fast and lean, but with all of these resources there is virtually nothing it cannot do. We call it a full-featured compact distro. The packages for Puppy 4.0 were compiled from source using T2 (http://t2-project.org) back in November 2007. There have been upgraded packages since then, however the original base packages (such as Xorg 7.3) are still being used. The latest official release, 4.3.1, has been and continues to be one of our most popular puppies, and is still "going strong", with many puplets (other puppies based on 4.3.1, such as Puppee, NOP and Lighthouse Pup). 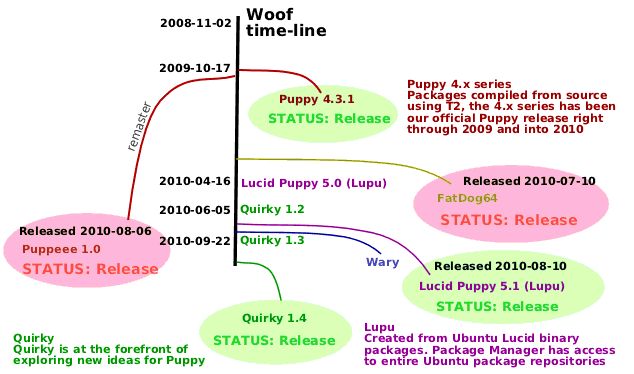 Barry Kauler, the founder of Puppy Linux and Woof, created Quirky as an avenue to explore the latest ideas. There may be some features in this distro that you won't find in other puppies, either different applications and utilities, different system scripts/behaviour, or even some fundamanetally new underlying behaviour. This is very much a moving target. Some of the ideas may be a bit strange, hence the name "Quirky"! "Upup" is our generic name for puppies built with Ubuntu packages. Our latest is "Lupu", built with Ubuntu Lucid Lynx binary .deb packages. What you get is a very small distro (the live-CD is about 130MB) yet with just about every application you would need and the speed and ease-of-use that Puppy is famous for. All of the advantages of Puppy, plus binary compatibility with Ubuntu .deb packages -- Puppy's own Puppy Package Manager will install any packages from the vast Ubuntu repositories!